Who left the camp food cooler open? Hey! No running around the campfire! What do you mean your tent is too smokey to sleep? Don't touch that camp stove, it's hot! Face the fact that no matter how much you warn them, or how sternly you lay down the rules - kids will almost always act like kids. You can avoid, (or at least reduce), potential problems with a camp set-up that let's them act like kids without causing, or getting into, trouble. Even in commercial campgrounds you usually have some flexibility in how you layout your campsite, and making it as kid-safe and kid-friendly as possible is your first step to ensuring a safe and enjoyable camping trip for everyone. 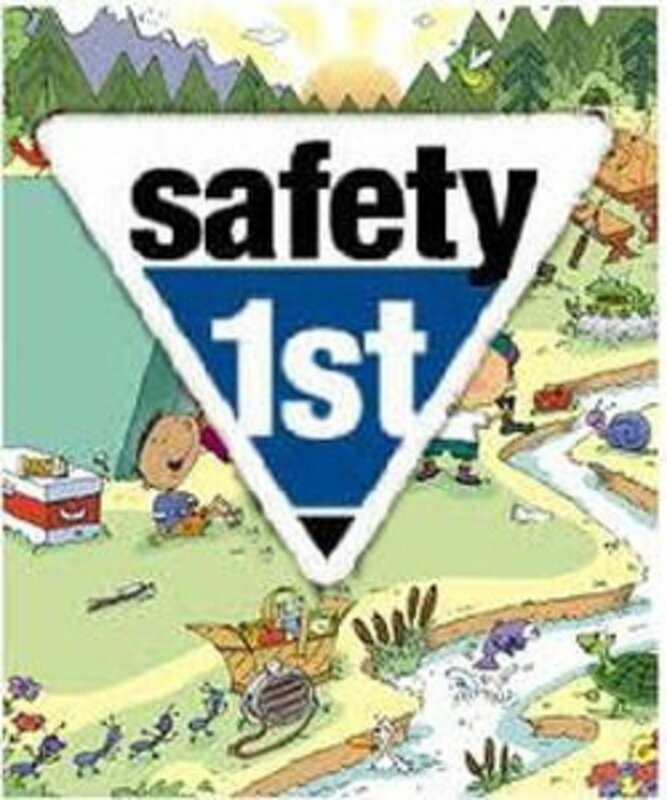 Your first thoughts should be where the most activity will be - which is usually the campfire and table areas, and then look at the traffic patterns that will be linking them together with the rest of the campsite areas; sleeping, cooking, and camp entrance(s)..
Then make sure you consider the kid's traffic patterns. From their tents to the food, the campfire, running in and out of the campsite, getting drinks, and so on. 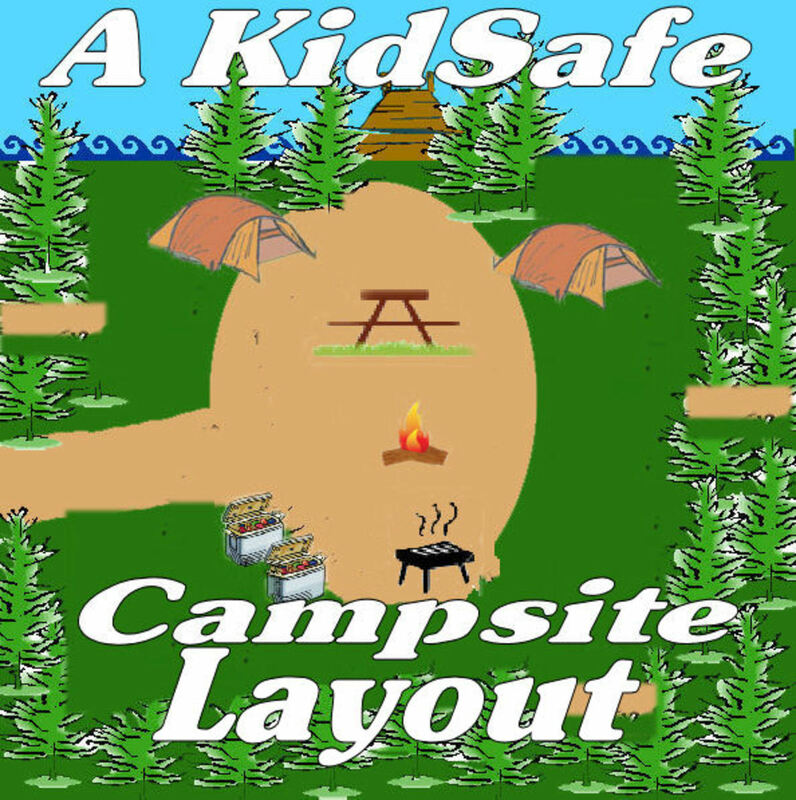 With those thoughts in mind, you will have a better idea of how to layout your campsite to avoid unnecessary kid-hazards. Like that hot camping stove, or repeated forays into the food coolers. Or in the worst case, tripping through the campfire while playing. This doesn't mean major or inconvenient reorganization. Sometimes just moving something, (the campfire, the tables, the tents), a few few feet one way or the other can make a huge difference in the flow of traffic through camp. For instance; placing the coolers at the edge of the cooking area instead of right next to the grill or stove. Or angling the table so the campfire is off the end of it instead of broadside to it. Thinking about the paths the kids will use as they travel through the campsite all day and night. 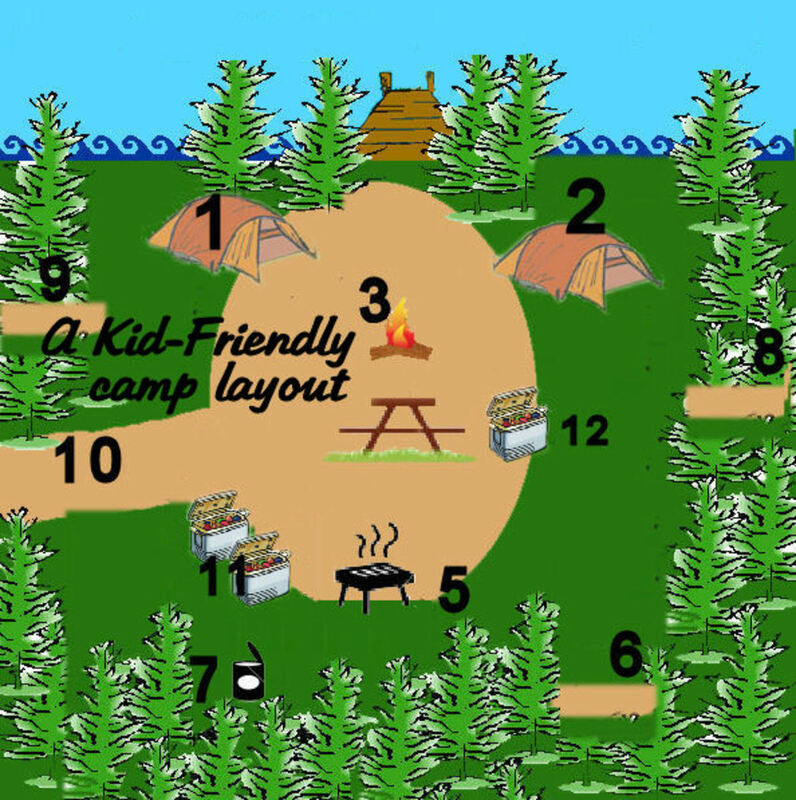 The campfire, cooking area, and tents should not be in, or interrupt the major traffic areas of the site. (notice the illustration shows a layout with an open traffic pattern that allows access to all areas, and in & out of camp, without having to cross through other major areas. 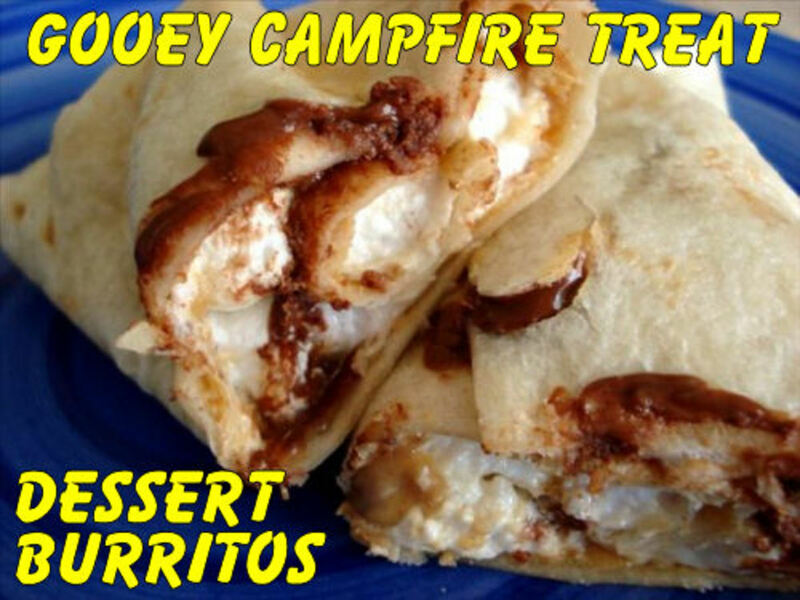 The campfire and eating area will be major gathering points in your campsite, and kids should not have to trample around the tents or through the cooking area to get to them. The cooking area will be where most of the heavy, and potential hazardous equipment will be, so be smart, and, save your back. It allows them to finish their day, and start a new one, with a view of what some consider the best part of camping - the campfire. It will also offer a degree of security for younger campers; they can see camp activity when they look out of their tent, instead of woods or brush. 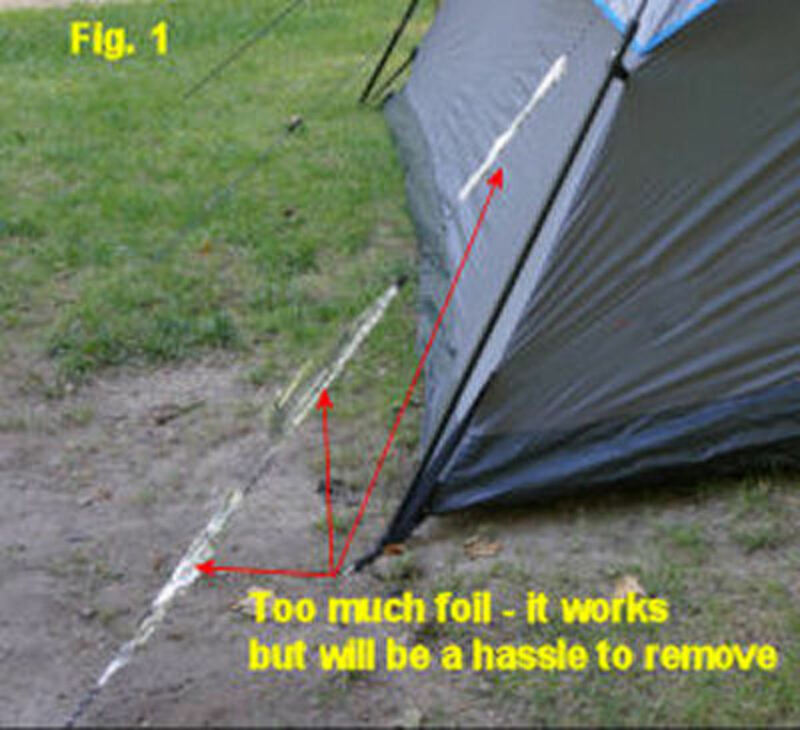 Always mark all tent or tarp guy-lines for visibility - A strip of white paper towel, or small square of foil, tied about knee-high makes guy-lines easy to spot, and less of a trip-hazard. 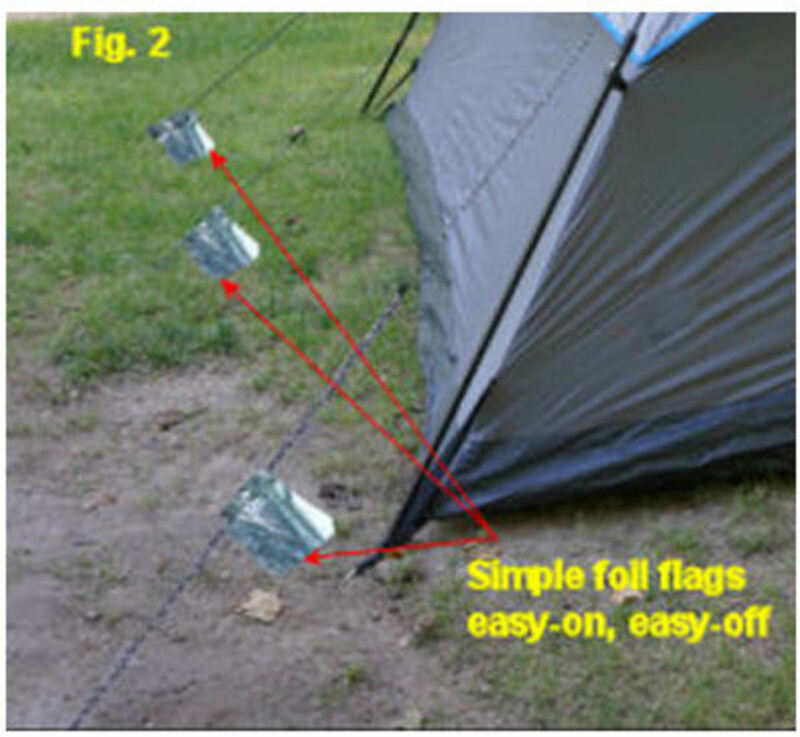 The small foil flags will even reflect moon or campfire light at night. As in the photos, a small square foil flag, (see Fig. 2), works easier and better than a lot of foil wrapped around the line, (see in Fig. 1), which will be frustrating to remove when breaking camp. Keep a clear campfire area - have at least 6 feet, (10 feet is better), of cleared ground around your campfire, and make sure there are no low-hanging tree branches over the fire. Flagging Tape - $3 Well Spent! If you camp with young kids - this could be the best $3 you ever spend. These little rolls of surveyor flagging tape are non-adhesive, and easy to tear. And so inexpensive you discard used pieces when you break camp. Use them for the camping tips mentioned above, or for marking trails, or dozens of other in and out of camp uses. The best part is that even kids as young as toddlers understand these colored tapes mean something. You just have to tell them what. You can even use different colors for different purposes. Orange or yellow for "no-no's" and red for hot or danger. The rolls are 1" x 150 feet - and only weigh a couple ounces. Note: Just scroll down the Amazon page and you will see options to buy other colors. Thank You very much for camping tips. It helps me find more save activities on my family journey. 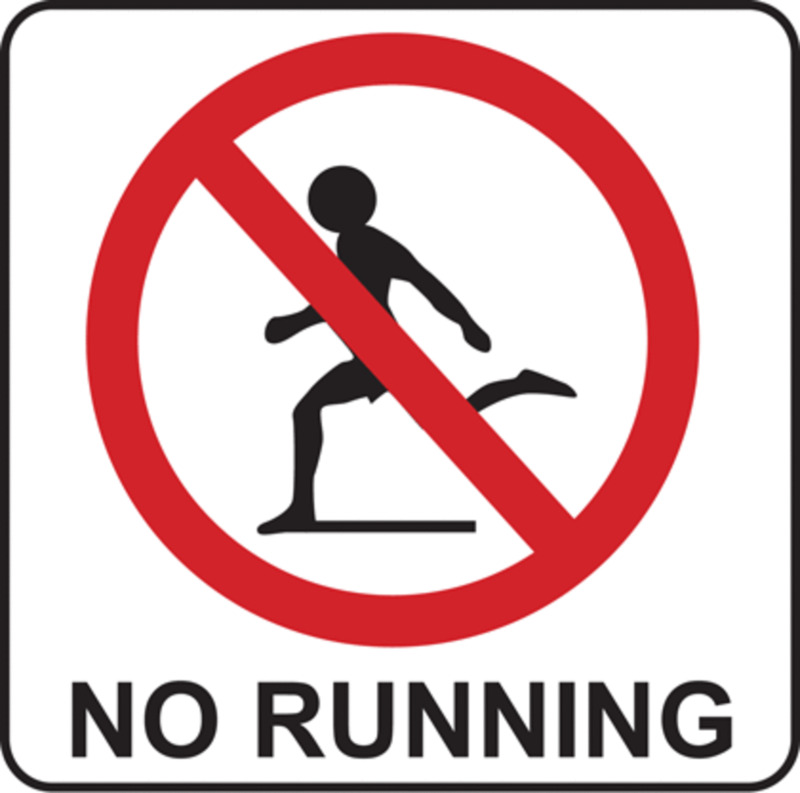 Especially for some games like scavenger hunt...really challenging for kids. I've tried it and my sons is very happy with that. Make my camping moment is become colorful. Thank You. May you have an opportunity you can visit my place in Indonesia. Please check my website www.selarasadventureland.com for reference. @Denise - Thanks for the compliment. The two worst mistakes I've seen people camping with kids make are: 1. Setting up the cooking and gear storage areas right in the center of the campsite, (then they get frustrated when the kids end up playing and romping around the stuff), and 2. Putting their campfire too close to the tent entrances. I like your format here-bringing the message and setting up a few 1, 2, 3's for easy recall. Nice job and interesting subject matter.